You may be surprised to learn that the world's fastest man, Usain Bolt, is the proud owner of a majestic cheetah. Given that both are known for their reputation as the world's fastest creatures, this pairing seems to be a match made in heaven. But the cheetah's story extends far beyond its need for speed; it's an animal of royal ancestry. Compared to other big cats, cheetahs are extremely easy to domesticate, thus making them popular pets. Ever since the days of the ancient Egyptians, cheetahs have held a place of honor as the "It" pet for the elite and many noblemen gave cheetah cubs as gifts to various members of the royal family in an effort to win favor in the Egyptian royal court. Its popularity as the house pet of choice for the nobility was boosted by its reputation as a skilled hunter. From the Persians to Genghis Khan, the heads of royal dynasties across the ancient world took their cheetah pride out on the hunt in a fashion that is almost identical to the way in which various members of the British royal family take their bloodhounds out on a foxhunt. Owning a cheetah as a pet is still popular today, but due to the animal's precarious position on the endangered species list, doing so is illegal in many countries. The English word "cheetah" is a tip of the hat to the animal's beautiful coat and actually comes from the Sanskrit word citrakāyaḥ, which means "the spotted one". The rarest of the species, the King Cheetah, is renowned for its unusual markings and its black mane. The animal's coloration and its association with royalty and the upper classes have morphed a peaceful Savannah creature into an emblem of status and power. To this day, numerous African statesmen and kings adore their official attire with luxurious cheetah skins. Even the highly revered Ethiopian Emperor, the honorable Haile Selassie I, was known for his fondness of cheetahs and was often photographed with his pet cheetah be his side as a sign of his nobility and reported ties to King Solomon. The animal's svelte body and sleek frame made it a popular subject in famous paintings of the Renaissance Period. Artesian painters like Titan and George Stubbs created masterpieces that accentuated the curves and quiet power of the cheetah. They are a big part of our modern pop culture. Every time you devour a packet of Cheetos, you are greeted with the always suave Chester Cheetah. If you were a kid of the 1980's you would definitely have fond memories of the TV series, Thunder Cats and one of its most popular characters, Cheetara. There are countless cartoon characters, both heroes and villain, whose spots have been indelibly imprinted into our childhood memories and out of the box strange movie references that left us wondering "What did I just see?" Of course, who can forget the antics of Harold, Kumar, and the cheetah on their way to White Castle? Now you can follow in the footsteps of the art masters and create Cheetah Tattoo that speaks to you! While some persons opt to have the entire animal in their design, others love the mysterious air of a Cheetah Print Tattoo. 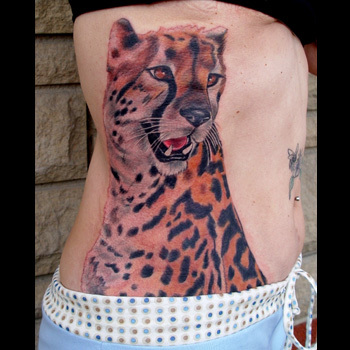 The most notable feature of any Cheetah Tattoo is its spots. Cheetah spots look great on any skin color and are fantastic pieces of artwork for broad surfaces, like your back, hips, or thighs. Placing a tattoo over large muscle group can add a sense of movement to the design, which pushes up the tattoo's appeal factor. Since this print is also a great way to subtly show off your animalistic nature, it's particularly popular with women who see themselves as exotic and alluring beauties. If you wish to channel your inner feline, a Cheetah Tattoo is a great design that looks flawless anywhere on every body type. Once you have perfected the placement of your piece, the most difficult task is getting accustomed to all the compliments that you'll receive. Cheetah print designs give tattoos personality and style, so don't be afraid to show your true nature. If you need tips on creating the perfect design, then visit us at www.itattoodesigns.com. Our team of artists can help you create an exquisite piece of body art.